“A Plan of Charles Town from a Survey of Edwd. Crisp in 1704” (1711, Edward Crisp) from Historical Maps of Charleston on SCIWAY, South Carolina Information Highway. According to historian Dr. Nic Butler, this is actually James Akin’s misleading 1809 “copy” of the Crisp Map. Read about it on his weblog. Although Charleston is not America’s oldest city (St. Augustine, Florida was founded by the Spanish in 1565 and is billed as the oldest European settlement) but certainly as compared to most of the country, we do have a long (and colorful) history. And since our forebears had the wisdom to establish the country’s first Preservation Society, some of the early buildings that survived the city’s numerous fires, storms, and battles are still standing today (but probably not as many as you think). Of course we tend to think of many of our buildings as old, but in Charleston there’s old and then there’s old-old. 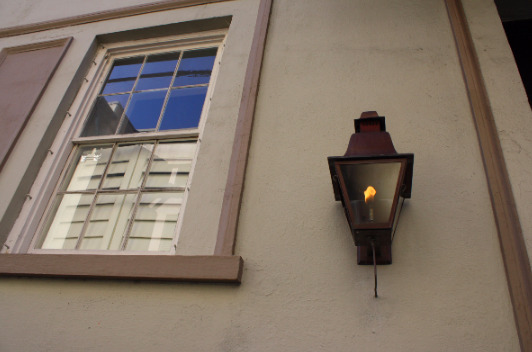 If asked what is the oldest surviving structure in Charleston today, what would you say? According to The Dwelling Houses of Charleston (Smith & Smith, 1917), “Of the buildings erected between that date  and 1710, not one can be asserted to exist today...” The Year Book of Charleston for 1880 lists a number of fires during this period that devastated the town: in 1698 a fire destroyed fifty dwellings; in 1699 another destructive fire; in 1700 most of the town burned. “Yet in 1710 there must have existed a high grade of architectural ambition...” as new brick churches and dwellings were built. But the fires of 1740, 1778, and 1796 left but little of the oldest part of the town unconsumed. Oh what a pity! Another tavern is the one at 120 East Bay, at the foot of Broad Street. Historic maps indicate that there was a Seafarer’s Tavern here in 1686. According to Mark R. Jones’ Wicked Charleston, its brickwork indicates that the current building dates to 1710. Originally built directly on the harbor, it has been known as Harris' Tavern, Coates Tavern, The Tavern on the Bay, or simply The Tavern. A 300+ year old booze house that still operates as a liquor store? Now that’s the best kind of old-old! There are a few other dwellings that date back to the first two decades of the 18th century--a couple on Meeting and Tradd Streets and even outside the walled city (the Colonel William Rhett House at 54 Hasell Street was constructed in 1712), but some structures on Cumberland Street are particularly interesting. Have y’all visited the museum at the Powder Magazine at 79 Cumberland Street? You should definitely check it out if you are at all interested in pre-Revolutionary battles, old artillery, pirates, or Charleston history in general. This is the only public building still standing from the Lord Proprietor’s period; it was authorized in 1703 and completed in 1713. By 1780 it was deemed obsolete, but thank goodness not destroyed. Threatened by the wrecking ball in 1902, The National Society of The Colonial Dames of America in The State of South Carolina purchased it in one of Charleston’s earliest preservation efforts and turned it into a museum. How about those Dames? Now here’s a curious one: next door to the Powder Magazine is a small structure that has been dubbed Judge Nicholas Trott’s house, but this has been a source of debate for some time. “Hanging” Judge Trott (1663-1740) was responsible for the sentences brought upon a number of pirates that plagued Charleston, including famous Stede Bonnet. Dr. J.L.E.W. Shecut’s 1819 essay on the topography of Charleston named it as Chief Justice Trott’s residence, as did Edward McCrady in the History of South Carolina (1901). Updated history at CCPL indicates that both historians were referring to the building at 85 Cumberland, not 83. 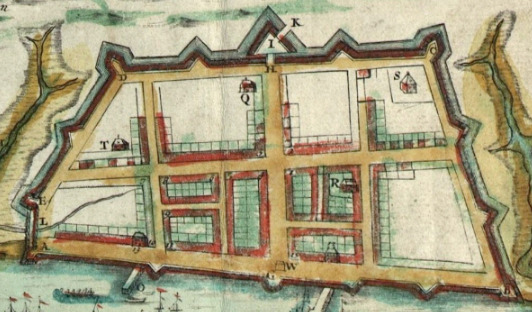 A 1739 map shows only the Powder Magazine; it does not show present-day 83 and 85 Cumberland (nor does it show Cumberland Street). The house at 85 Cumberland does appear on a 1788 map; the building at 83 Cumberland does not. Kitchens, stables and other out buildings were omitted from both of these early maps. The conclusion generally accepted by historians is that 83 Cumberland was probably an outbuilding to 85 Cumberland; the central chimney indicates it was probably a kitchen. Both structures date from the 18th century, but not from the early Lords Proprietors period. The earlier map omitting the dwellings was published seven months before Trott’s death; it is unlikely he ever lived in either. While much attention has been given to the two-story structure at 83 during its tenure as a restaurant, tea room, bookstore, etc. over the years, the original main dwelling house at 85 Cumberland has been overlooked, but (of course) it has an interesting story. A promising real estate investment turned sour for the man who paid $11,000 (Confederate dollars) for the property in 1863, but was only able to get $850 for it in 1880. 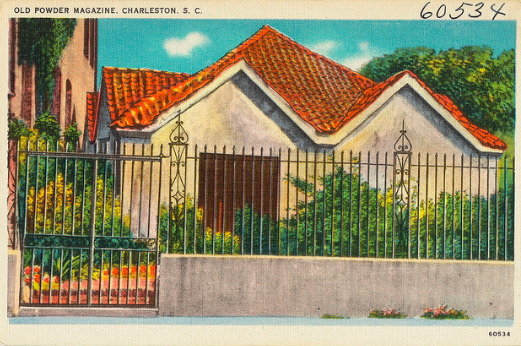 A Do You Know Your Charleston article in the News and Courier indicates that there was an ongoing debate in 1945 over which was the oldest brick dwelling house in the city--85 or 83 Cumberland Street. McCrady noted that the dwelling originally had three floors but was badly damaged by the great fire of 1861. “It was gutted, and when rebuilt upon the old still substantial walls, the third story was left off.” Today, only the first floor is left of the original 1700s building. The thickness of the original brick is indicated by the recess of the present upper story walls at the point of juncture with the old walls. The second story had been removed by 1912 and in 1913 or 14, two new stories were added to the building and an elevator was added to the rear when the old dwelling was converted for use as a factory. In 1917, a garage and two floors of offices were added to the rear. In the 1930s, the building was used for offices by the Works Progress Administration--the plans for the Santee-Cooper hydroelectric project were drawn here. In 1945, the building was converted into 24 modern apartments which were leased by the federal government and rented to war workers. Formerly known as the King’s Gate Apartments, the French Quarter building was acquired by a developer about ten years ago and underwent extensive renovations and remodeling to be converted to the beautiful Market’s Gate Condominiums. A fourth floor was added to allow the creation of six penthouse homes and 18 flats were created on the ground and second floors. 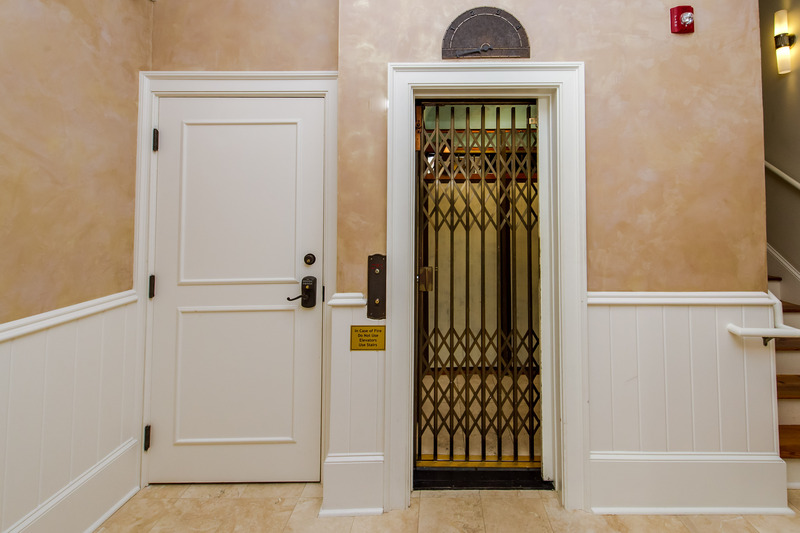 The developers kept the old-style elevator with scissor doors (which we love) as well as other original architectural details. Lois currently has a one bedroom, one bath second floor apartment available for sale in the building. 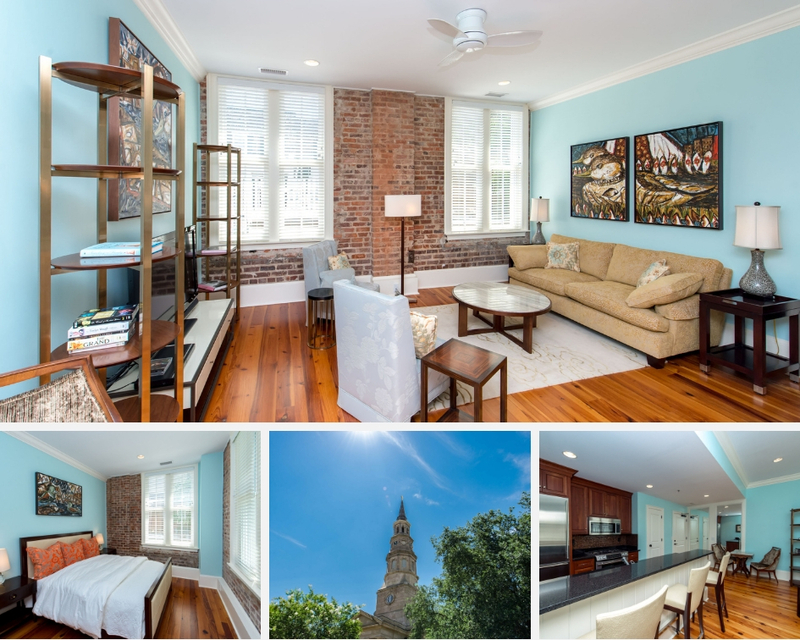 It features hardwood floors, exposed brick walls and top of the line appliances and fixtures... not to mention a beautiful view of St. Philips church. Brittney currently has a fully furnished unit at 85 Cumberland available for lease. 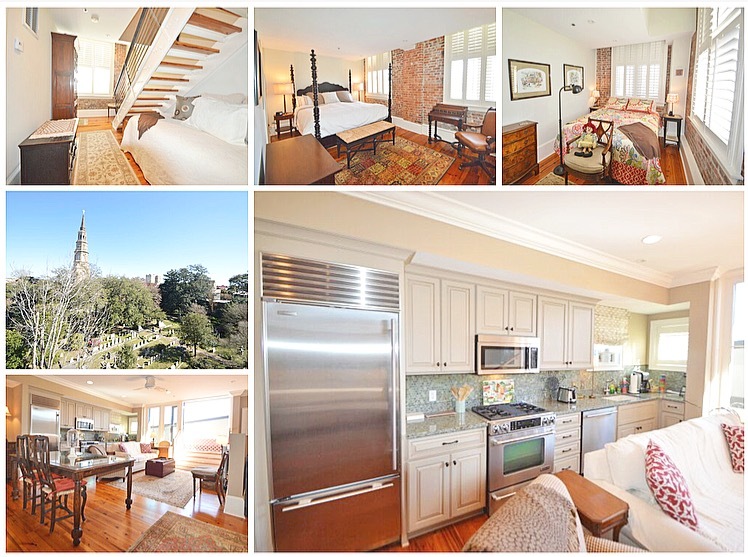 This 2 bedroom penthouse features 11' ceilings, exposed brick, high-end appliances and a large balcony where you can take in incredible views of historic Charleston. Rent is $3,400/month. Click the photo below for full listing information and please call Brittney at 843-352-8684 to schedule a showing!